Girls and women in Nepal are often viewed and treated as second class citizens. Whilst this attitude is changing in urban centres, in many rural communities, these views still persist. Many families view educating women as unnecessary and are therefore unwilling to spend money on formal education for their daughters. Often women are instead expected to begin work as agricultural labourers or marry and begin a family at a young age. As a result, many Nepali women have only basic levels of education; only 55% of the adult female population is literate. 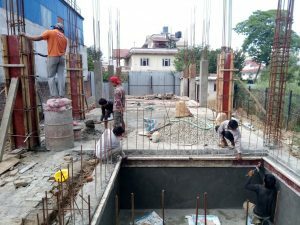 In 1997, International Needs Nepal set up the Lydia Vocational Training Centre and began a five-month residential programme for young women to come to Kathmandu and receive vocational training. Women are identified for the Lydia programme by a network of 40 International Needs community workers based all around the country. Many of the women who are in most need come from communities in extremely rural regions of the country. The five-month training course is run twice per year and the centre currently takes on 22 women for each course (44 women per year). The course focuses on empowering women with education and supporting them to develop vocational skills to enable these women to set up their own businesses and better support themselves and their families once they graduate. Since its inception, over 800 women have graduated from the Lydia Vocational Training course. One of the vocational skills taught at the Lydia Centre is tailoring. 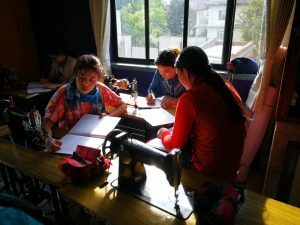 During their five-month course, the women receive training to become professional seamstresses, as well as education in literacy, music, health, theology, nutrition, public speaking and a variety of other classes. Upon leaving the course they are also provided with tailoring equipment including a sewing machine, and other resources to enable them to start their own small scale businesses. On graduating, the change in the women is stark. They have a new-found sense of confidence, optimism and can return to their villages and be change-makers. Funds given to the Lydia programme are used on running costs, including food, building maintenance, training materials, utilities and medical care. On graduation, every Lydia lady is also provided with a sewing machine and resources to enable her to begin her own tailoring business if she wishes. Make a one-off donation to our Livelihoods Projects using the donate button. Sponsor a place on the Lydia programme (Please get in touch for more information). In 2017, International Needs began a new partnership with advertising agency Ogilvy UK. Ogilvy has previously supported the building of Buikwe Secondary School in Uganda. With Ogilvy we are extending the Lydia Programme in Kathmandu and running a three-year livelihoods project within the Sindhupalchowk region. As well as fundraising, volunteer trips from Ogilvy to Nepal will take place to assist the work. Through this, the Lydia Vocational Training Centre will be able to extend the programme to facilitate the training of over 60 women per year.